Most people think of “Mush” as the command for dog sledding. But “Ready, hike!” is better. “Ready” gets the dogs’ attention. Whether they’re chewing on a paw or socializing with one another or peeing on a bush, they stand at attention as soon as they hear that word. The dogs react to “Hike” like racers when the starting pistol is fired. They take off and pull the sled up and down trails in snowy woods of pine and spruce. I’m just along for the ride. 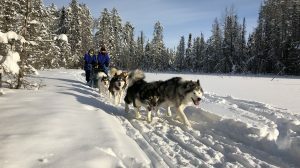 A dog-sledding trip to Ely, Minnesota, was organized by Ole Miss Outdoors, a program of the Department of Campus Recreation. The nine-day trip, Jan. 12-20, cost only $600 per person, thanks to the planning of trip leaders-graduate students-intrepid adventurers Francis Liaw and Alison Walker. Twelve of us, mostly Ole Miss undergraduate and graduate students, went on this adventure. And it was an adventure. To get to Ely, which is 1,148 miles and almost a 22-hour drive from Oxford – you’re practically in Ontario, Canada – we traveled in two Ole Miss SUVs and stayed in unique Airbnbs along the way. When we reached Ely, snow was falling heavily and covering the roads. One student from a Mississippi town commented that he had never seen this much snow. The cabin we stayed in, part of Wintergreen Dogsled Lodge, was comfortable and cozy. Besides several bedrooms, it had one big dining table that seated all 12 of us, a great room with a gas fireplace, and modern kitchen and bathrooms. We met our main guides, Isaak Ridge and Joe Gleiter, who were not only there for the dog sledding but also checked to make sure we had appropriate clothes, brought and made breakfast and dinner for us (including special meals for the vegetarian among us), as well as shared the meals with us each day. Isaak loves to talk about everything and anything, and Joe is a mellow surfer-type dude from Illinois who loves salsa at every meal. He also enjoyed snow cream for the first time, which some of our group prepared one night, and we all wondered if snow cream is a Southern specialty since those among us from outside the South had never heard of it. We also met an unexpected guest, Kayuk, one of the sledding dogs, who enjoyed being petted and exploring the cabin. Before leaving the cabin on the first day of dog sledding, we went over the “Do’s” and “Don’ts” of driving a dog team, such as “DO stand firmly on the brake when stopped or your team may take off without you” and “DON’T panic if you lose the sled – yell “LOOSE SLED” and the guides will get it.” Besides “Ready, hike,” we also learned the all-important “Whoa,” as well as “Gee” (go right) and “Haw” (go left). We then dressed for the -4 degrees Fahrenheit weather (we were lucky since the temperature had dropped to -30 the week before) and went to the dog kennel. I carried my phone to take photos, but I guess it wasn’t made to function in subzero temperatures. It immediately froze and turned off. At the kennel, we were asked to set up six dog sleds (two drivers each), harness our dogs and then hook them up on a line in front of the sled. For me, this was the hardest part! All these dogs love people, but they didn’t necessarily love one another. Sometimes, we had to pull at the dogs to keep them from fighting each other. It took about an hour, but my sled partner and I were ready with lead dogs Gabe and Millie, swing dog Inuk and wheel dogs Mudro and Okra, as were the other members of the group with their sled-dog teams, and our guides, who were traveling on cross-country skis. What a scenic and crazy ride. We rode through miles of wooded trails. Sometimes it was peaceful, and I could just enjoy the beauty of the surrounding northern woods, part of the Boundary Waters Canoe Area Wilderness*, made up of more than a million acres of wilderness and waterways. Other times, I felt like I was in a Space Mountain-type bumper car without a seatbelt when the sled would careen off a tree and/or the sled would tilt, and I’d have to lean the other way or go flying off – that was scary. When going up steep hills, my sled partner or I would lessen the load for the dogs by jumping off the sled. Whenever it was my turn, I’d usually fall, and it was hard to stand back up and keep up with the sled while wearing heavy clothes and boots in powdery, foot-deep snow. Sometimes we went downhill, including one time when we had to duck to avoid an overhanging tree branch (and a major concussion). More often than not, when we stopped, our dogs literally HOWLED with impatience. We would then pet and praise them to calm them down. They all have endearing personalities and habits. Inuk was steadfast and calm, for instance, while Mudro likes to bury his face in the snow any chance he gets. We stopped for a campfire lunch, which also gave the dogs a chance to rest. We gathered twigs for the fire, and the guides cooked sugar-cinnamon bagels in a skillet and handed out cups of cocoa, frozen cheese sticks, meat sticks and Snickers bars. It was hard, if not impossible, to unwrap the snacks while wearing thick woolen mittens and outer mitts, but my hands instantly became red and frozen when I took the mittens off. That was the coldest part of the trip, just sitting still. Toward the end of the day, we rode on the vast, frozen White Iron Lake. At one point I jumped off the sled and tried to walk a while and realized it would be frightening to have to walk across this lake alone, battered by snow, wind and cold, trundling along in my heavy boots and clothes. It wasn’t like a walk in the park. It was more like a walk in a frozen desert. Dog sledding is truly useful for those who live in harsh winter climates. Just past sunset, we finally unharnessed the dogs and leashed them at a wooded spot down the hill from our cabins in the dark. We put out hay for them to lie on and gave them food and water. Back at the toasty warm cabin, I don’t think I ever appreciated warmth, food and sleep as much as I did that night. The next day, after breakfast, we went out on our second dog-sledding adventure. Unlike the previous cloudy day, this day was sunny and several degrees warmer. In fact, it got up to 14 degrees, the same temperature as Oxford that day. During another campfire lunch, the dogs lay down in the snow and napped peacefully. We went on a different, even more challenging but fun trail that included a long downhill run. I was getting the hang of this dog sledding thing. It was only when all the dogs were back at the kennel that I realized that I’d only known them for such a short time and I’d miss them. The day didn’t end there, though. The end of a dog sledding trip at Wintergreen includes an “optional” activity. We put on our bathing suits and socks and went into a very hot sauna, six at a time. Then when we felt like we might faint, we ran down a hill and jumped in icy water, cut out with a chainsaw. It sounds crazy, but all 12 of us did it, and it truly did feel exhilarating. The next day, we all received diplomas for completing our dog-sledding adventure. Then we packed up and left for the International Wolf Center, also in Ely, where we stayed overnight and were able to watch a pack of “ambassador” wolves in a wooded enclosure though an observation window, as well as learn all about wolves through the center’s educational program. The following day, we headed home, staying at two Airbnb houses along the way in Eau Claire, Wisconsin, and St. Louis, and we made it back to Oxford’s balmy 40-degree weather. On a trip like this, we all got to learn a bit about one another, had a lot of laughs and shared an unforgettable trip. We even learned a secret handshake, but I can’t tell you what it is because it’s secret. 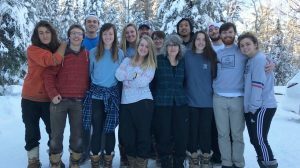 Past weeklong Ole Miss Outdoors trips have including backpacking in the Grand Canyon, skiing and snowboarding in the Colorado Rockies, kayaking and snorkeling in the Florida Keys, and another dog sledding trip in Canada. OMOD also schedules daylong and weekend hiking, caving, rock climbing and whitewater rafting trips as well as other types of trips. For a spring 2018 schedule and more information about Ole Miss Outdoors, go to https://campusrec.olemiss.edu/ole-miss-outdoors/. *On our first night in Ely, some of us attended an environmental lecture about efforts to save the Boundary Waters from being poisoned by sulfide-ore copper mining. For more information about that effort, go to https://www.savetheboundarywaters.org/. Benita Whitehorn is an assistant director/editor in University Communications.